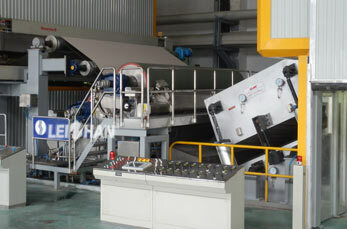 Sizing machine plays an important role in paper production process. It can highly improve the toughness and smoothness of end paper products. The strength of kraft liner board paper can be improved by sizing. Leizhan is committed to design and manufacture advanced and state-of-the-art paper machinery and spare parts for paper plants. Between front and back drying section, there is inclined column type surface sizing machine. Leizhan sizing machine applies to pneumatic pressurizing and double rolls drive. The sizing machine contains the following parts: rolls drive, sizing roll, hard roll scraper, Sizing device, glue overflow device, lifting equipment of glue overflow device, walking board, glue collect tank, paper leading roll, sizing roll scraper. With 34 years experience in paper making machinery, Leizhan is dedicated to design and provide high technology paper machinery and advanced paper making solutions for paper producer. Sizing machine is specially designed by Leizhan engineers to improve the quality of end products.